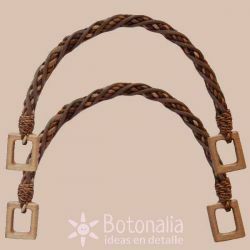 In this section you will find notions that will be useful to produce your own custom handbags. Handles in wood or plastic, in various models, to create your own bag or to replace damaged handles in your favorite bag. Some carry their own loops ready to sew, and in other cases it is necessary to buy the loops separately. Closures to use when creating your own purses and bags, or to repair a damaged accessory. Rings and loops to pass belts and straps in handmade bags, or to replace spoiled pieces of your favorite bags. Carabiners to hold straps in bags and other accessories. Metal nozzles to help create your own purses, small bags, glasses cases and other accessories. Key rings that can be incorporated into a bag, snap buttons, buckles and other products. Magnetic closure for handbag in old gold color.Content: Both magnetic pieces for the closure and two washers.Diameter: 14 mm.Material: Plated steel and magnet.Manufactured by Clover. Magnetic closure for handbag in black nickel.Content: Both magnetic pieces for the closure and two washers.Diameter: 14 mm.Material: Plated steel and magnet.Manufactured by Clover. Metal rings in the shape of a D, in old gold color, for belts or handbag closures.Content: Two identical rings.Inner width: 20 mm.Material: Zinc.Manufactured by Clover. Metal rings in the shape of a D, in old gold color, for belts or handbag closures.Content: Two identical rings.Inner width: 30 mm.Material: Zinc.Manufactured by Clover. Product Description: Handbag handles. Content: a set of 2 handles. Dimensions: 12 x 16 cm. Material: Plastic imitating wood. Warning: it needs metal loops to fix it and they are not included. Product Description: Handbag handles. Content: a set of 2 handles. Dimensions: 12 x 16 cm. Material: Plastic (transparent) in purple color.Warning: it needs metal loops to fix it and they are not included. Product Description: Metal loops in silver color for handbag handles.Content: 4 loopsDimensions: 30 x 34 mm.Max. width: 15,75 mmMaterial: Metal. Metal rings in bronze color to hold bag handles. Content: 4 rings Dimensions: 30 x 34 mm. Max. width of the handle: 15,75 mm Material: Metal. Product Description: Handbag handles. Content: a set of 2 handles. Dimensions: 33 cm (full length when open) Material: Wood, vegetal fibers and plastic. Handbag handles with the shape of a U. Design bamboo style in ivory color with darker marbled effect. Content: 2 handles, including loops. Dimensions (without loops) : Width 15 cm. Height: 11 cm. Material: Plastic. Manufactured by Clover. Handbag handles with the shape of a ring. Design bamboo style in black color. Content: 2 handles. Dimensions: 16 cm (outer diameter). Material: Plastic. Manufactured by Clover. Metal carabiners for belts or handbags, etc. Content: 2 carabiners. One in nickel color and another one in bronze color. Diameter of the opening: For tapes or belts up to 13 mm. wide.Length: 37 mm approx.Material: Brass.